Do you do tradeshows and want to have attendees notice your booth. Stand up banners help create energy at a booth. It can be like a giant version of your business card, a great way to feature your services or show what you do. Are you a character? A lifesize version of you on a banner can make a real impression. Full color, 32.5 x 82 inches, this great retractable sign display banner allows you to maximize your display coverage! Equipped with floor stands and a nylon carry bag is included. Minimum is 1. 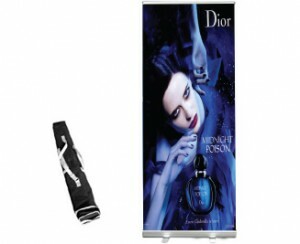 Stand up banners are 277.00 ea. with a 40.00 set up. Art must be in 300 dpi or greater for clear and crisp product. Order yours today. Normal production is 4 weeks so order early!